Incompletely gestated and somewhat uneven, writer/director Jordan Peele’s Us is a bit of a letdown after his brilliant debut feature Get Out, but the acting, cinematography and score are first class and there is some brilliant imagery. Peele is to be applauded for his ambition, even if he doesn’t quite realise it here. 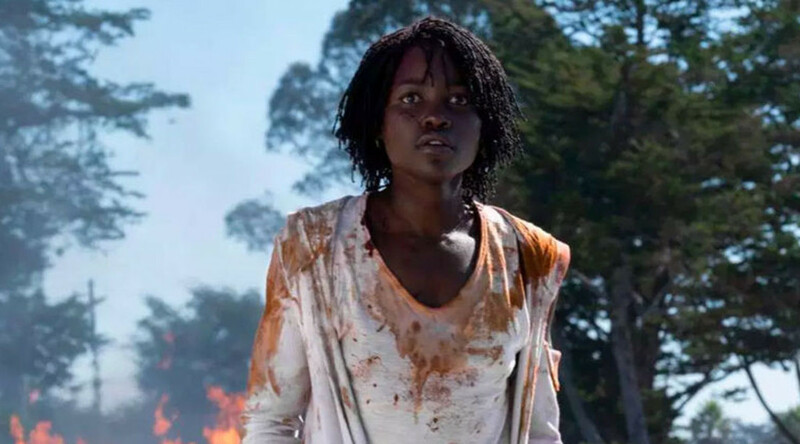 Us is the new film from Jordan Peele, who set the film world alight in 2017 with his startlingly original, brilliantly conceived and executed debut feature Get Out. As with Get Out, Us is an off-beat hybrid of horror, psycho-thriller, comedy and social commentary. And again, Peele draws on a giddy and richly imaginative mix of weird and unsettling dramatic elements and comes up with some arresting imagery. However, Us doesn’t work as well as Get Up, either as sheer entertainment or figuratively, and it’s nowhere near as conceptually complete. Indeed, I was left with the sense that it needed more gestation time and went to screen prematurely. It gets off to a great start, with a portentous preliminary textual announcement that there are thousands of miles of tunnels of no known purpose beneath the United States, followed by a tense and intriguing prologue in which a young black girl, Adelaide (Madison Curry), has an experience in a deserted beachside funhouse so traumatic that she is struck mute. Flash forward to the present. A now-adult Adelaide (Lupita Nyong’o – terrific), capacity for speech fully recovered, goes on a lakeside holiday with her cheery but dorky husband (Winston Duke) and their two kids. The lake just happens to be near the beach of her childhood trauma. Huh? Why would she go anywhere near there, let alone, as she subsequently does, spend a day on the beach with her family within site of THE funhouse? Further, her youngest child wanders off just as she did (wouldn’t she be watching the kids like a hawk? ), and has a strange encounter of his own before she tracks him down in a panic. There are more than a few such logic flaws throughout the film – plus some gaping plot holes – which I found disappointing after the rigorously thought-out Get Out. Still, small bickies at this point, as the intrigue continues to build, peaking when one evening another family appears in the driveway. Turns out there’s something extraordinarily familiar about the new-arrivals. And something very, scarily, different. And that’s all you’re getting of the narrative, folks. Knowing anything more about what happens will detract from the work’s power and your enjoyment. I can say that the film forfeits much of the carefully-developed intrigue and gradually loses tension as it morphs into a pretty standard horror format that takes us through its long middle section. There are monstrous adversaries who are initially a bit scary, but the fear factor decreases as we realise that we’re in familiar territory: that is, the nasties appear unbeatable but ultimately yield all-too-easily amidst much fighting and chasing and blood-letting which stops short of outright splatter. And of course, there are instances of apparently disposed of nasties coming to life again and sneaking up on an unaware victim. Curiously, the weaponry is confined to kitchen utensils and in the case of the mysterious attackers, big golden scissors. What, no guns? This is America! Sure, the cinematography, score and acting are all first class, but when it comes down to it, we’ve seen this stuff a zillion times before. And it goes on far too long. To be honest, I got a little bored – that would have been unthinkable in Get Out, which was gripping from the first frame to the last. When the film enters its resolution phase, things get interesting again. You wonder how the hell Peele is going to bring it all together. Well, he doesn’t. Not plausibly, at least – and I mean plausibly in terms of the film’s inner logic – we’re not dealing with realism here. There’s a final scene I can’t detail (too spoily) that sums up the problems of the film for me: it’s an impressive parting image that stays with you, but has no practical raison d’être, functioning only figuratively. The same criticism applies to much of the film. If only Peele had managed to coherently tie in all the stuff that’s going on so that it operated on all levels, he could have had a second masterpiece on his hands. However, in the case of Us, he’s over-reached himself, and just couldn’t do it. Sure, there’s more than enough on offer here to set off fevered debate and interpretation on the meanings of the film, and not everything needs to be explained away by the filmmaker – but incoherence and incomplete articulation is another matter.